You asked of Me, and I am GOOD for it, says the LORD. I will give it. I will supply it. I will over supply, for I Am more than enough! Just hold on now! Hold on to My hand that holds you up and keeps you steady on your feet. Hold onto My hand that formed you. Hold onto My hand that protects you. Hold onto My hand that provides for you! For I created all things and control all things. All that I have created is within My power to do with it as I please. The silver and gold belong to Me. My streets are not paved with silver, but gold. I have an abundance of all things. I Am your all in all! I will feed you and cloth you and furnish you, for the earth belongs to ME, and I have more than enough for all who trust in Me, says the LORD. You are not a beggar. You will not eat the crumbs that fall from under My table, says the LORD. My children eat and drink freely and continually. There is an endless supply. I own it. I furnish it. I control it. I handle everything that is under My dominion and power, and all is Mine, says the LORD. You belong to Me, and you will not be crawling, but walking. You will not be under the table or on the floor beneath, but seated at the table, next to Me in My presence. Open your heart and know that I Am your GOD! Open your eyes that they may see. Open your ears that they may hear! For I Am your all-sufficient GOD, and I do not need to hunt for a bargain. I have the best, and do the best and Am the best for you. You will not walk in poverty and darkness and lack, for you will eat and drink and be fully satisfied with the good things that I have prepared for you, My child, and you will be fat and full of My blessings. 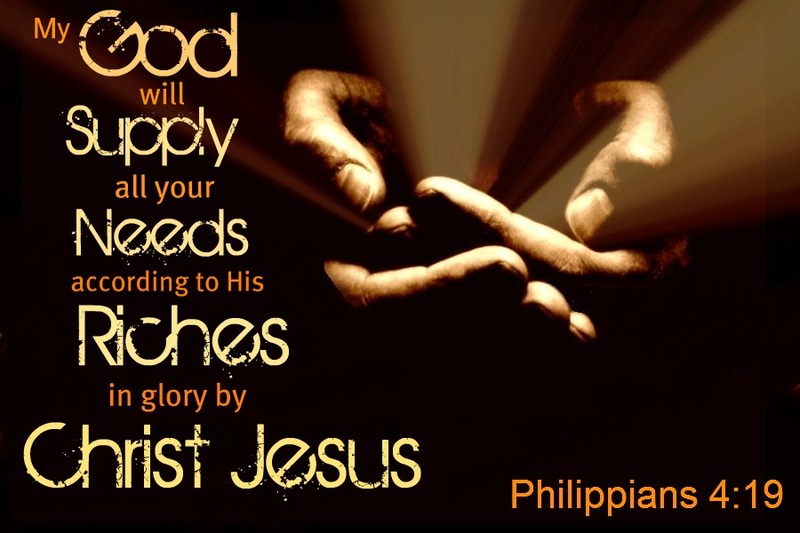 You will have left-overs, not just sufficiency, for I Am a God of abundant supply, and you are not exempt from My blessings upon blessings that will enrich you to become as I Am, a blessing and benefit to others, says the LORD. Yes Lord You are my God and Provider! AAAAAAAMMMEENNNN and AAAAAAAMMMEENNNN. YESSSSSSSSSSS LORD I AM EXPECTING AND I RECEIVE THIS POWERFUL MESSAGE IN JESUS MIGHTY NAME AAAAAAAMMMEENNNN AND AAAAAAAMMMEENNNN! I greet you and thank you. I am a Syrian Palestinian. I live in Lebanon. I have four children. I fear fear and fear. As I leave the camp, I was beaten and humiliated in front of my children. I am tired of everything. I find a way to a decent life and stability for my children. I am a human being and it is my right to live a decent life and a quiet life for my children. Please help me to resettle and travel your country. I am a human being for my children. I hope for you. Amen!! Thank you Father God. You are soooo amazing and so good to me. I receive it. has formed me more and more into your image of light, my Great high Priest. What a wonder you are, daily I’m so amazed in you, you surround me with favor. day, such a blessing indeed so. Hallelujah !! !